I had the privilege of attending a screening of the upcoming film Rules Don't Apply. It is a drama romance of two fresh-faced Hollywood newbies who are brought together through their employment with Howard Hughes. Warren Beatty wrote, directed and starred as the eccentric mogul. 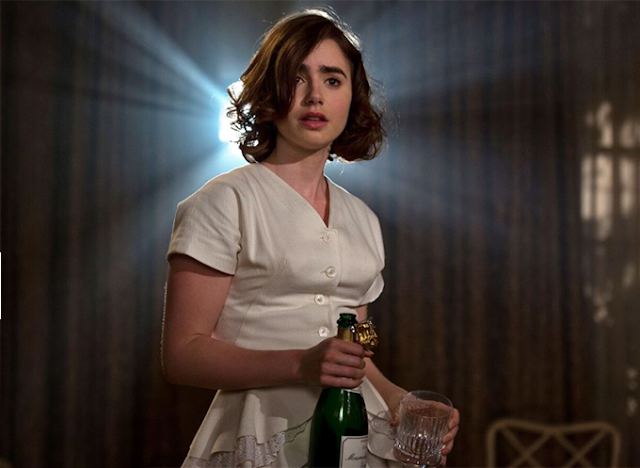 Lily Collins plays ingenue Marla Mabrey under contract to screen test for Howard Hughe's new film The movie sheds light on the inside stories of the countless young females who were subjected to excessively controlled lives just for the opportunity of becoming a star. If you love the aesthetic of vintage Hollywood, this is a movie for you. Marla Mabrey's makes an angelic impression with her first look when arrives onscreen in a layered peplum jacket from costume designer Albert Wolsky. The light colored outfits that the hopeful starlets wear reflect the optimism of the actresses in the beginning. The darker colors and sharper silhouettes reflect how many of them quickly learn how Hollywood is not the fantasy they thought it would be. I loved that Lily Collins played Marla as initially innocent and naive, but fiercely principled and self-aware. When thrust into awkward situations with Howard Hughes and his staff, she continually sought to take back control of the situation through questioning and wit. 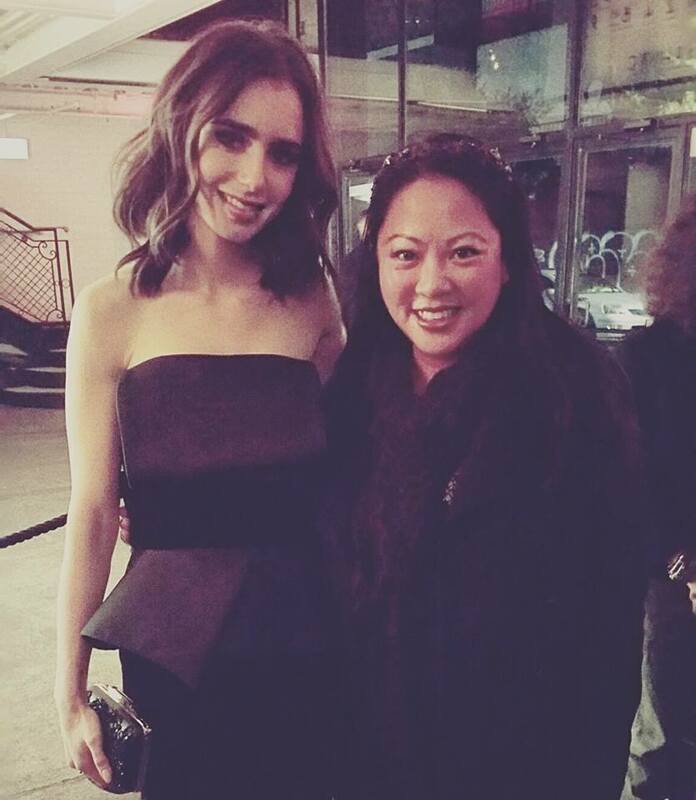 I got to chat with her about how she approached this role at the screening. She was intrigued in reading about the many nameless women who experienced what Marla Mabrey experienced. She sought to bring depth and heart to the once hopeful starlets that history had forgotten. Ms. Fabulous: What was your inspiration for your performance as Marla Mabrey? Lily Collins: I felt a connection with her (Marla Mabrey) when she first came to "Hollywood" to audition. I was "naive" because I am always a positive thinker instead of the negative. There is a lot of politics that go into Hollywood, but she is very passionate and determined as I am, but she didn't have the bigger picture. She needed her Mom there to help her. Her moral compass was very strong, but Hollywood is there to test all that. Through the trials and tribulations that she went through, she was forced to overcome that and deal with what it takes to be in Hollywood, and decide if she agrees with what she wants it takes. Luckily, she learns a lot about herself in the journey. Ms. F.: You had mentioned earlier that you had read books about some of the women who had lived this experience. Were there specific stories of an actress that struck you? LC: No, Marla was more an amalgamation of women who came back from Hughes that struck me, that these stories were true. That they would come with their Moms and live there for weeks, months, years. It struck me, who would do that today? But women did because they had that hope of the dream. It was shocking, yet commendable. Ms. F: I am a big costume fan, that first outfit with the layers of peplums! LC: Ah yes. That was the first look we tried on. Right away I knew that was Marla! We made multiple of them. Ms. F: And today, a much more contemporary look. It's lovely. I hate to ask this, which designer are you wearing today? LC: This is Zuhair Murad. Ms. F: Thank you, Lily!